For Crohn’s disease (CD) and ulcerative colitis (UC), the main entities of inflammatory bowel disease (IBD), our recent meta analyses have identified a total of 99 risk loci that still explain less than 25% of the estimated heritability . Recently, a hallmark publication has pointed out potential sources of the so-called “missing heritability” . Inherited epigenetic changes, such as methylation patterns, are one of the potential sources. The proof-of-principle exists that feeding pregnant mice with a mutated copy of the agouti gene a methyl-supplemented diet can alter the coat color not only in their children, but also in their children’s children. In addition, those yellow-colored mice where the mothers received no methyl-supplemented diet during pregnancy are more prone to disease than their non-yellow (agouti-colored) siblings . A recent study has also demonstrated that prenatal exposure to famine in humans leads to hypomethylation of the IGF2 gene . In our project, we will further develop the necessary epigenetic toolkit, including Next Generation Sequencing, and analytical platform for methylation pattern studies. As a first task, we will establish a genome-wide map of the inflammation methylome in DSS-treated mice (a model for inflammation in the intestine). The hypotheses gained will then be tested in material from human specimens. For this, a large biorepository exists via the associated PopGen biobank . Once the techniques are in place, the transgenerational inheritance of methylation patterns will be examined. A good example study is described in Carone et al. . A framework for state-of-the-art methylation studies exists at both involved institutions [7-9]. The project is a collaboration between the Institute of Clinical Molecular Biology (ICMB; Kiel, Germany), the Human Genetics Department (Kiel, Germany) and the Kaser group at Cambridge University (UK). All initial mouse experiments have been carried out in Prof. Kaser’s former laboratory in Innsbruck. The project follows a thorough treatment and breeding protocol and different cell populations are isolated for analysis (see Figure 1). RRBS library preparation and analysis is currently set up at the ICMB. As a next step, methylation maps and transcriptome patterns will be generated for the DSS-treated mice of the first generation. 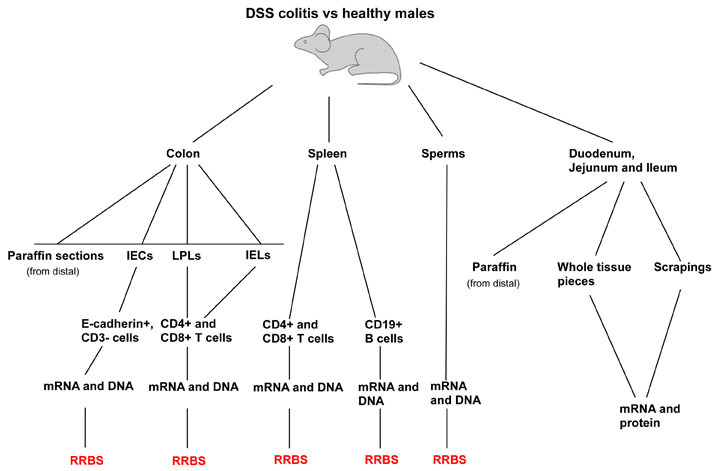 Figure 1: Different tissues and cell populations are isolated from the DSS-treated mice. These samples are then subjected to Next Generation Transcriptome/RRBS sequencing (figure provided by M. Tschurtschenthaler from the Kaser group). Franke, A. et al. Genome-wide meta-analysis increases to 71 the number of confirmed Crohn’s disease susceptibility loci. Nature genetics 42, 1118-25 (2010). Link. Manolio, T.A. et al. Finding the missing heritability of complex diseases. Nature 461, 747-753 (2009). Link. Wolff, G.L., Kodell, R.L., Moore, S.R. & Cooney, C. a Maternal epigenetics and methyl supplements affect agouti gene expression in Avy/a mice. The FASEB journal : official publication of the Federation of American Societies for Experimental Biology 12, 949-57 (1998). Link. Heijmans, B.T. et al. Persistent epigenetic differences associated with prenatal exposure to famine in humans. Proceedings of the National Academy of Sciences of the United States of America 105, 17046-9 (2008). Link. Krawczak, M. et al. PopGen: population-based recruitment of patients and controls for the analysis of complex genotype-phenotype relationships. Community Genet 9, 55-61 (2006). Link. Carone, B.R. et al. Paternally induced transgenerational environmental reprogramming of metabolic gene expression in mammals. Cell 143, 1084-96 (2010). Link. Kreck, B. et al. B-SOLANA: An approach for the analysis of two-base encoding bisulfite sequencing data. Bioinformatics (Oxford, England) 28, 428-429 (2011). Link. Krueger, F., Kreck, B., Franke, A. & Andrews, S.R. DNA methylome analysis using short bisulfite sequencing data. Nature methods 9, 145-51 (2012). Link. Eckmann-Scholz, C. et al. DNA-Methylation Profiling of Fetal Tissues Reveals Marked Epigenetic Differences between Chorionic and Amniotic Samples. PloS one 7, e39014 (2012). Link.